The website for Annapolis cosmetic dentist Dr. Yasaman Roland was developed specifically to showcase her expertise in several fields of dentistry. From the in-depth, thorough procedure pages to the artistic and tasteful design, the website draws patients in and provides them with a positive dental experience that brings them back for more. Dynamic graphics and pull-out tabs create the aesthetically pleasing tone that highlights Dr. Roland’s attention to cosmetic detail. The procedure pages utilize readable language to ensure patients are comfortable and informed, while every bit of content is 100% custom created and optimized to receive the highest search engine ranking possible. 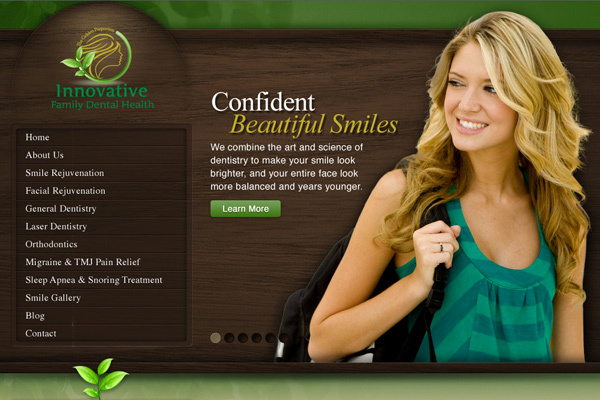 Combining the latest techniques in dental website design with a captivating graphic layout, Dr. Roland is able to make sure her website stands out in the competitive market of dentistry and orthodontics. Our experienced team of website design, development, and writing experts worked with Dr. Roland every step of the way during the crafting of her site to produce a uniquely individual and personalized creation that displays her prowess in dental procedures such as teeth whitening in Annapolis. To get a better look at the type of website Rosemont Media can create for you and your practice, visit drrolanddental.com.